I am not sure whether the dogs help with bikeist/blind-folk interfacing. One issue is that the dogs aren't easy to get. You often have to wait 1-3 years for a dog and they only last 7-8 years on average before needing replacing (often with a wait in between). Whereas you can buy a white cane for £25 and training is more easily available. How versatile are guide dogs? I read somewhere that they learn their owner's individual common routes and just know by rote where to go, stop, etc. If so that suggests they're not much use when road and building layouts change, let alone in a new area. Whereas a white cane is presumably the same thing working in the same way wherever you are. Same problem with canes. It'll keep you on the right line and stop you from bumping into things, but you have to learn the route. Though there's some scope for using technology (eg. GPS+image recognition, or phone-a-sighted-person-with-live-video) to off-load some of this, it's a bit hit and miss. Dogs can see, which makes them better at improvising around small changes (but they will occasionally fall foul of dog-thinking, eg. guiding the user into an above-dog-height obstruction, or getting distracted by things a human wouldn't). Humans with canes are cleverer, which makes them better at high-level decision making, iff they can work out what's going on. What works best for individuals can be very different. And that's before you consider additional factors like dog-maintenance or a service animal making people more willing to engage with you. Canes don't work well with moving objects. Hence kerbs, tactile paving, etc, to indicate where the moving objects are going to be. I don't think there is a simple solution to this one, short of banning anything faster than walking pace, people rigorously obeying all road rules or some advanced technology that can recognise and track an oncoming cyclist. First build your autonomous vehicle, then scale the sensors and processing down to something wearable? To my untrained layman's eye, quite simply the bike lane is in the wrong place - which leads to the existence of this non-problem. Put the bike lane in the road and unfloat the bus stop. I get the feeling that AVs are no better. Roughly speaking, Lidar=cane. It's good for checking that the space you are about to move into is clear, but much like driving in poor visiblity, it's pretty poor at anticipating when something else is likely to invade that space from the side. Granted, most drivers are too. That makes the bike lane unusable whenever there's a bus stopped, or the bus unable to pull in if there's a cyclist passing. Fine if numbers of buses or bikes are negligible, but unworkable when both aren't. Or just part of the cycle education. After all every kid does their cycle training when they are in primary school right? Same as they are taught how to cross the roads then... or is that just a Dutch thing ? Same as how drivers will find this exotic infrastructure hard to fathom at first, so will cyclists, and pedestrians. How many floating busstops are there in the UK now? How many visually impaired people will have had their walking with cane training to include floating bus stops? I hadn't realise the give way on zebras wasn't until you stepped on. As a sighted ped, I always wait and make eye contact with drivers until I'm sure they're going to stop and not just run into me. Many visually impaired folk can't do that. Depends on the country, and depends on the drivers. I confused some Dutch drivers by standing at what I hadn't realised was a zebra crossing, eating an icecream, and all the motorists had stopped so I could cross... At many Dutch crossings there will be lights, *AND* zebra stripes, first time I came across this I almost got killed as I walked out onto what I thought was a zebra crossing, but which turned out to be a light controlled crossing at the time, but a zebra when the lights aren't in use... But yes, in the UK, until you put a foot, or the tip of your cane onto the zebra crossing, there is no requirement for the vehicles in the carriageway to give way. Many will, but that's not the legal requirement. Attention's the thing, isn't it? I'll be driving along and say "Ooh, Rohloff" to barakta who won't have even seen there was a cyclist. On the other hand, she can spot a hearing aid at 50 metres. I expect more of the population are tuned into dog-spotting (for one reason or another) than noticing blind people. Cynically I suspect the public's attitude to dogs is also more positive than to disabled people, or indeed cyclists. It says much about the UK that it's the Royal society for the prevention of cruelty to animals, yet the National society for the prevention of cruelty to children. It's also worth noting the former is older than the later. A white cane is maybe 1.5m long, 10mm in diameter, that's not exactly a big object to spot, at speed in the cluttered urban environment (I wonder how driverless cars will cope...). A dog is large, even if it doesn't have it's coat on. I didn't know that! Do you know if it's international or just a UK thing? *VERY*, the girlfriend of a friend of mine is blind and has a guide dog (a poodle). She travels with the dog both within Germany, and also abroad to the UK, Austria etc... Yes dogs can get to know the local area and can work on auto pilot, but they are very well trained and can work just as well in an unfamiliar city. 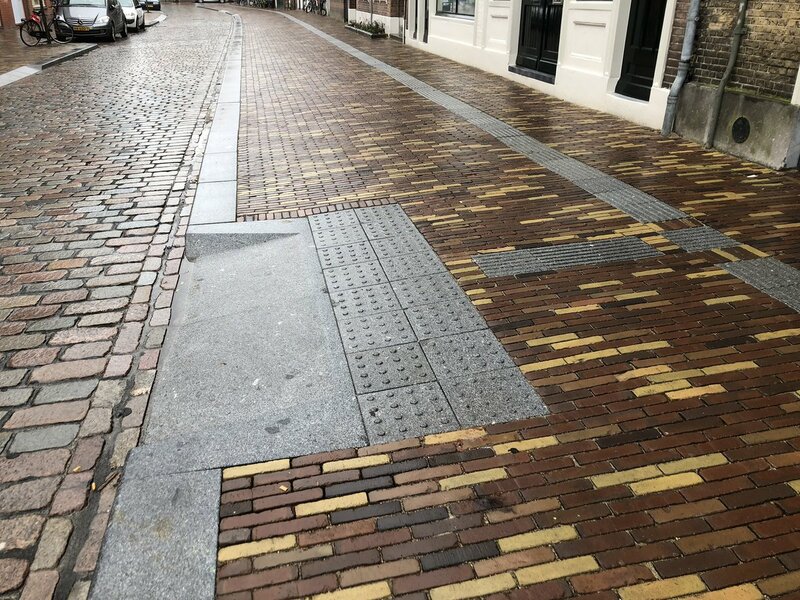 The tactile paving allows someone with visual impairment to find their way along the street and to the various junctions. The problem is this is not universal, and that can make it harder. Where else would it go? To a Dutch person this is exactly the right place for a bus stop. They are so pervasive it's the normal. The only reason it's not to you is you're not used to it. I'll see if I can find a visually impaired Dutch person who's brains I can pick on the subject. David Blunket's guide dog once caused him to vote the wrong way when it lead him through the wrong lobby in the hosue of commons. I'd say that every kid does cycle training in the same way that everyone knows what the red stripes on the white cane mean (which I think is not international, I have a feeling I've seen red stripes on the canes of hearies in Poland). Dogs are fairly versatile in new areas but they are reacting to information in the environment and it is their user who is making the decision based on dog reactions. So for example dog will stop at a 'road' and only move when the blind person says it is safe as the dog cannot make that decision although it can indicate if it sees a threat which the blind person has missed. When working with blind colleagues we sometimes crossed at the logical crossing point with no crossing and cos I was doing the sight the colleague would order the dog to cross even tho the dog was cagey about the cars. Without sighted human assistance the blind colleague would have to walk quite a way out of their way to the light controlled crossing. While the dog does learn routes so the blind person can say "take me to X" they can also find specific objects like "find the till" and will aim for tills in shops or find the top/bottom of steps. Often people assume the dogs can navigate like a SatNat which isn't the case. The blind person still has to work out where to go by whatever means and instruct the dog based on what info they get from the dog and their own senses. Ex colleagues' dogs used to be able to find the zebra crossing on campus and the stairs up to the path before our building. They both had training for the campus routes and if they needed to go somewhere new they either had to have sighted human assistance or blind-person friendly directions... One of them experimented with talking GPSes but I don't think the tech was quite there yet, but might well be better now. Similar to a cane except you can't say "find the tills" and have to either ask, use residual vision or ask around. I don't think it's representative. No it's not representative, normally there's at least one taxi blocking the entrance to that floating bus stop. One serious problem with the floating bus stops on Oxford Road is that they are just not big enough, very often it's impossible to figure out who is actually doing what at the crossing points simply due to the heaving mass of humanity, this leads to them being habitually ignored. That's a problem with lots of bus stops, floating or not, and regardless of cycle lanes. At a bus stop you have more people than at any other point of the pavement, and they're crowded into a smaller space, because the bus stop itself takes up some room and the bus bay (where the bus pulls in) takes up even more. A consequence of prioritising vehicle flow over people flow. In central London large dogs are unusual. So a guide dog might offer different advantages compared to other parts of the country because the unexpected tends to stand out. For anyone thinking about it, guide dog puppy walking is very rewarding. You have to be very disciplined with the dog, but, the end result will make you wonder why pet dogs don't get the same early training. *nods* I suspect that is a definite factor although finding suitable dogs that can "handle" London is a challenge. A friend @blondehistorian on twitter says she's expecting a wait over over 3 years cos she needs a small guide dog cos she's petite which can handle Central London which is a big demand. Former blind colleague - a big man and over 6 foot tall - used to live in Balham and had a German Shepherd as his guide dog at the time cos it needed to be able to walk FAAAAST. From talking to blind folk who've done canes and dogs, the dog has the advantage of people noticing more and while annoyingly engaging with the dog, it breaks the ice. There is this weird thing where some/many folk will completely avoid a blind person cos awkward even when they know them (used to see this at work with former colleagues) which happens less with the dog cos people talk to that. I know a puppy walker who used to take her trainee dogs to London, but can no longer do so because train companies have now restricted the free train travel provided to puppy walkers to one-stop-local/slow-services-only.